March for Life in The Land of the Glorious and Free.... except if you disagree? Well, it rhymes? Maybe we really do need to look at a re-write of the anthem. Along with removing the words, "God keep our land" we can reassess whether or not we are a free nation. 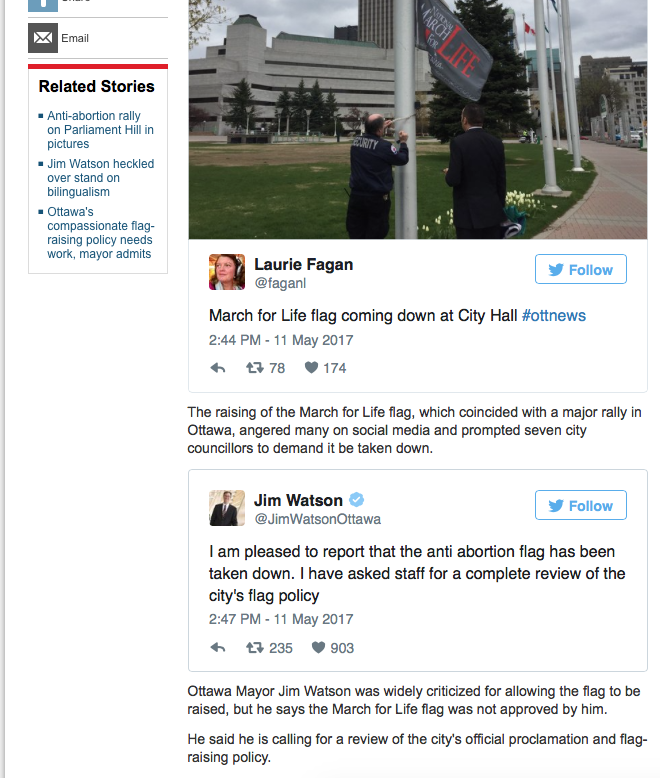 This is screen shot of what CBC reported as victory against the pro-life movement's "March for Life" flag. The sad thing is that I voted for Jim Watson. I thought he was a good, moderate candidate. I thought he would defend liberty for citizens. No one is saying that we must all be pro-life supporters. If you are pro-abortion, you can have a protest right under the flag and you can throw tomatoes, eggs or gender neutral pronouns at the flag. G'ahead. It's your right. But it is other Ottawa Citizens' right to follow due process, apply for a permit, as Mr Barrett did, and have the flag raised to celebrate a nation-wide cause. It was up for less than 4 hours. Unbelievable. Has anyone got an extra copy of 1984?